I called my mother yesterday and told her I was making corned beef for Saint Patrick’s Day. I thought she would be pleased, because she often points out that I put more emphasis on my father’s Judaism than on her English-Scottish-Irish heritage. And she is right. Whenever my siblings and I were asked in school to write a report on family history, we always seemed to choose the Jewish side. Our Judaism felt more exotic, more compelling–frankly, like a better story–especially since we were just about the only Jews in our little New England town. I made the mistake of bragging to my mother that I was planning to write about Saint Patrick’s Day, and she took the opportunity to grouse at me that this blog tends to focus on Judaism most of the time. And again, and as usual, she is right. I usually see interfaith issues through my Jewish lens because I was raised as a Jew (her agreement with my father), but also because Jews are frantically concerned about the growing number of interfaith families, whereas most Christian denominations do not feel demographically threatened by intermarriage (exceptions might include Catholics, other Orthodox Christians, and Mormons). Even while I find myself writing from a Jewish perspective, I resent the way that this perspective dominates the discourse on interfaith families–one of the reasons that I insist on referring to myself as interfaith, rather than half-Jewish. “So are you making Jewish corned beef, or Irish corned beef?” asked Mom. I was momentarily silent, stunned by the idea that even corned beef must fit into a religion box. “I don’t know Mom, what’s the difference? The package has a leprechaun on it, so I guess it’s Irish,” I replied. “Well Mom, I guess that’s because you’re a common-law Jew now,” I replied. My mother, though she never converted, refers to herself as having a Jewish heart. Being one-sixteenth Irish was important to me, growing up in Boston. Being Irish is a big deal in the land of the Kennedys, and everyone wore green to school on Saint Patrick’s Day. By wearing green, by surprising my friends (who thought of me as Jewish) with my display of pride in my Irish roots, I was able to cross over for at least a day and experience life in the majority. Then came the terrible moment when my mother informed me, sotto voce, that to be historically accurate, I should probably be wearing orange, not green, since my Irish family had married into Protestantism in the New World. I was horrified. This was the late 1960s or early 1970s, and I knew that Irish-Americans from Southie were throwing rocks at buses as Boston schools desegregated. In Boston, orange was the color of the colonial oppressors, of the English. If I were to wear orange to school on Saint Patrick’s Day, I thought I might possibly risk getting beaten up. I was steeped in the traumas of Jewish history at Sunday School, but now I began to contemplate how strife between Christians can be as powerful and violent and persistent as strife between Jews and Christians, or Jews and Muslims. And I began to think about how interfaith families sometimes hide their roots beneath yarmulkes, or tam o’shanters. My Irish Catholic great-great-great grandfather, Michael Gorman, immigrated to America from Clonmel, a town noted for its resistance to Oliver Cromwell and the British. The Gormans are an ancient Celtic tribe, probably converted from their pagan or druid religion by Saint Patrick or his ilk. 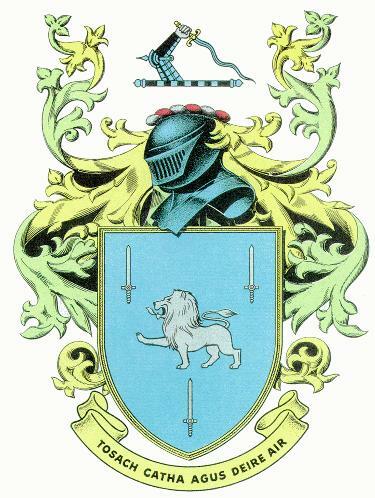 The word “Gorman” is thought to come from Celtic for “little blue ones” and the family crest features a blue shield. This may have something to do with Celts painting themselves blue to intimidate their enemies in battle (as in the movie Braveheart). So before they were green or orange, I guess the Gormans were blue: a pagan stripe in our interfaith family rainbow. Maybe on Saint Patrick’s Day, I’ll wear blue. But, returning to the corned beef I made last night, it was a big hit. I avoided pledging culinary allegiance this time to either the Jews or the Irish. Instead, I found a Joy of Cooking recipe that calls for slathering the meat in brown sugar, mustard and soy sauce, to create a vaguely Asian corned beef. I called my mom to urge her to try the recipe: her big Jewish heart often craves Chinese food. Nice blog – I enjoyed it! Never underestimate the complexity of your dear Mother! We had a “pre-fab” corned beef from Giant last night. Does that make us nonsectarian, or simply unaware of which culture we are participating in? As it turns out, there’s considerable evidence that Irish-Americans adopted corned beef from Jews in New York, as a thrifty substitute for a certain cut of bacon they couldn’t find in the New World. In Ireland, they didn’t eat corned beef and cabbage at all. So corned beef and cabbage really is an all-American interfaith recipe, taking its place alongside green bagels. As an Irish-Dutch Catholic* of Franco-Jewish extraction back down the line in Europe (straight patrilineal kohein actually, with an odd familial predilection for falling into judicial or ministerial jobs!) whose family has made it an odd habit of living in Jewish neighborhoods in New York and New Jersey for…heck, centuries at this point (I’ve lost track of what-generation Shabbos Goy I’m considered), I can attest to this as at least the long tradition that the Old Irish of New York swear to dating back to the the first rounds of chain-migration from the Isle. Dang! I missed this one. Nice blog, sis! It never occurred to me to talk to my kids about my Catholic Gorman sliver. To them, my cultural Judaism is exotic, and my recessive Protestant stripe is vaguely comforting at best. I’ll wear a blue tie to Josie’s First Communion. Erin go bra-less! I enjoyed your article. My wife is Irish and I am Jewish. It can take some time, but one can enjoy both cultures without losing either. FINALLY just realized that the definition for what I am religiously is called “Interfaith” ! 🙂 I enjoyed your post coming from a blood Irish Jew. Thank you. Welcome Russ. More and more of us are claiming the benefits of an interfaith label.